Kevin Gibb of TechInsights published recently an article in EE Times that shows a teardown of the lithium-ion battery used inside the iPhone 6 Plus. While the teardown and the article seemed motivated by determining the cost of this battery — somewhere near $4.00 — it contained some very nice cross sectional photographs taken using optical and electron microscopy of the various layers that make the iPhone 6 Plus. Anything that carries an Apple logo seems to attract a lot of attention, but the battery inside the iPhone 6 Plus is similar in performance and structure to many other Li+ (lithium-ion) polymer batteries used in mobile devices. For example, the battery capacity of the iPhone 6 Plus is rated at 2.915 Ah, within a rounding error of the capacity of batteries used in the Sony Xperia Z3 and Z3+, the LG G3 and G4. Let’s use this very nice teardown report of the iPhone 6 Plus battery to shed more light onto the inner structure of a lithium-ion battery and its workings especially in view of fast charging. I described in an earlier post the various shapes of a lithium-ion battery. A 18650 cell is encased in a metallic cylinder, whereas a polymer one is a thin and flat pancake-like without any external metallic protection. 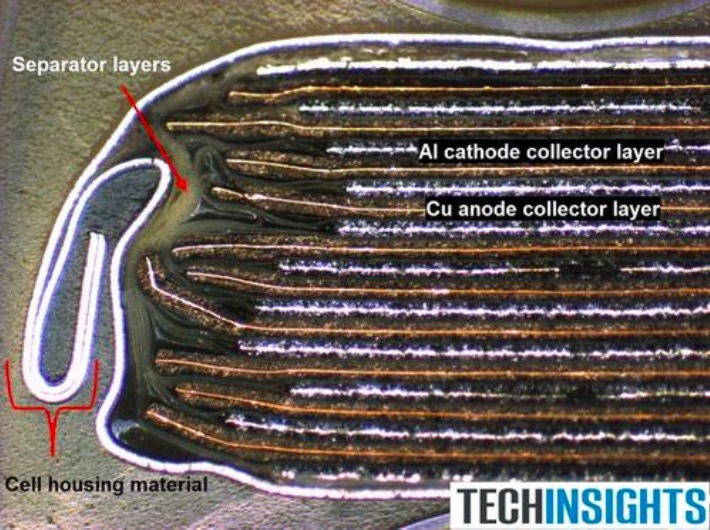 Yet, the insides are nearly identical, all consisting of a set of electrodes called anodes opposing another set of electrodes called the cathodes with both sets of electrodes separated by a porous membrane called a — hold your breath — “separator.” The first picture below shows a cross section of the polymer battery inside the iPhone 6 Plus viewed through an optical microscope. For reference purposes, the iPhone 6 Plus battery is approximately 3 mm thick. In mobile devices, the vast majority of batteries use a metal oxide called lithium-cobalt-oxide (LCO) deposited on an aluminum backplate to act as the cathode (the positive electrode during charging). You can see the bright white aluminum back layer in the photo above, but it is difficult to see the LCO layer at this magnification. The anode is nearly always made of a thin carbon graphite layer deposited on top of a copper backplate. There is a very thin separator layer that sits between each set of anode/cathode layers. During charging, the ions, yes, the lithium ions, travel from the cathode through the porous separator to the anode, and embed themselves inside the graphite. As every skilled engineer should know, charge balance means that there is an opposing current made of electrons that goes through the external circuit between the anode and the cathode. This means that maintaining a low electrical external path resistance is essential to the operation of the battery — one of the reasons why aluminum and copper conductors are used. The photo above shows a stack of alternating layers of anodes and cathodes. There are 11 anode/cathode layer pairs, which means the pitch is approximately 275 microns. This particular construction is unique to LG Chem with a stack of parallel layers. Other battery manufacturers use what is known as a jelly-roll, with the layers of anodes and cathodes rolled together like a cigar. This mechanical structure, while seemingly immaterial to the novice, plays a big role in the distribution of electrical current inside the battery, and consequently the governing degradation mechanisms. Let’s zoom in a little more. The second photograph shows a scanning electron micrograph (SEM) of two sets of anode/cathode layers. Now we can see the individual structural materials. The separator is typically near 10 to 20 microns in thickness. 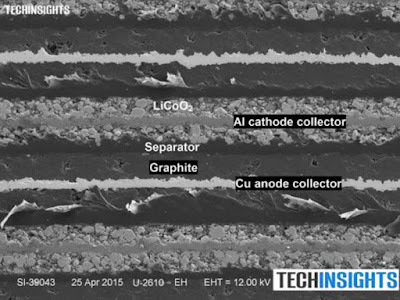 The graphite and LCO layers are often around 50 microns but can vary depending on battery capacity and current rating. This SEM now shows that the LCO layer is granular in nature. The graphite layer is granular too. The grains, varying in size from a few to several microns in diameter, consist of crystalline layers — a lattice-like — where the lithium ions can embed themselves. In charging, they embed themselves in the graphite lattice, and in discharge, in the LCO lattice. The graphite lattice is pictured next using a transmission electron micrograph (TEM). The lattice is made of atomic layers that are a mere 0.34 nm apart — think of it as atomic Swiss cheese. The LCO and graphite have a limited capacity of how many lithium ions they can “hold” inside their lattice. This determines the amount of LCO and graphite material that is needed for a battery of a given capacity, i.e., of a given mAh. This in turn determines the energy density. Well, sort of, because there is another kink in the design of the battery, and that is the size of the grains (both LCO and graphite) and how tightly packed they are in the electrode layers. If the grains are too tightly packed, then the lithium ions will find it difficult to travel through all the grains; in other words, the maximum current capability of the battery is impaired. So you are hopefully getting a little taste of the various compromises a battery designer needs to go through….and we haven’t even yet gotten to charging. Now let’s talk about the headaches that come with degradation of this structure especially with fast charging. High capacity and/or faster charging means a lot of ions need to zip in and out of the anode layers — since the anode is primarily responsible for storing the ions during charging. Think of cars on a highway at peak rush hours….it’s not easy; every pothole in the road now contributes to traffic flow. For example, small perturbances in the uniformity of grains means more ions will flow into one grain vs. another, thus creating differences in current density, and excessive stress on some grains (ultimately causing mechanical fracturing of the graphite lattice and loss of capacity). 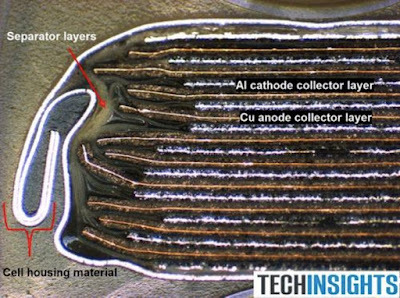 Small disturbances in the voltage distribution across the layers means some portions of the stack may see a potential difference between the anode and cathode that will promote the metallic plating of lithium — a very detrimental failure mode especially present with faster charging. These are only but two examples of the degradation mechanisms. There are several more that are becoming prevalent in modern batteries with high energy density and faster charging. The task is to tame these degradation mechanisms to extract maximum performance, and that is now falling onto the next frontier of clever charging algorithms — and that is what we do at Qnovo. Fast charging a battery clearly involves a high degree of optimization in order to manage the large flow of ions. Historically, battery vendors did it while sacrificing grain size, or packing density of grain; in other words sacrificing energy density and overall battery capacity. This compromise is no longer acceptable.